ATLANTA — The lives of two dogs were saved after Angels Among Us, a pet rescue based out of Atlanta, used social media to get the pooches adopted.A picture was taken of dogs Kala and Keira hugging in their pound cell. The picture was posted alongside a warning they were about to be euthanized and a heartbreaking story told from their perspective. 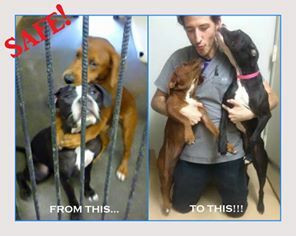 Just two hours after the photo was posted, the doggie duo was adopted. The original post was shared nearly 9,000 times, and the picture of the pups with their new owner has been liked over 20,000 times.